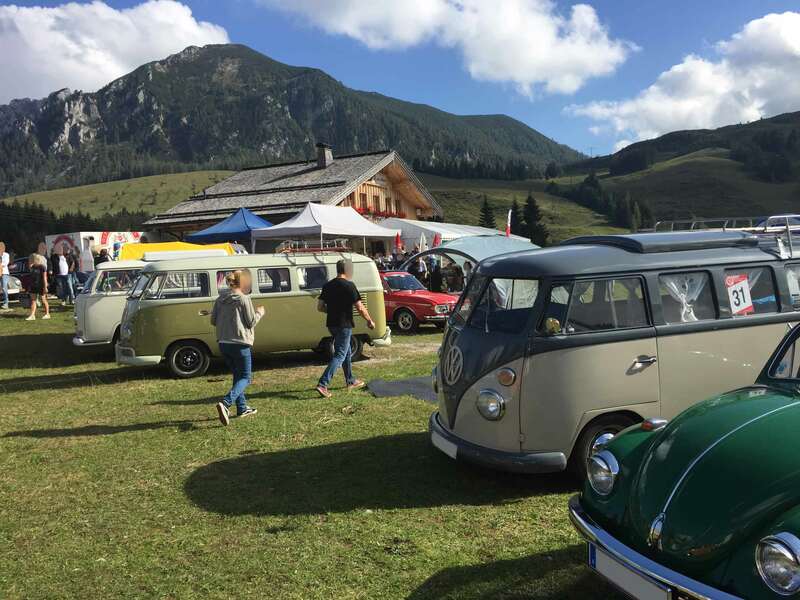 On Saturday, 8th of September, 2018, ich decided to drive some hundred kilometers to Salzburg as the first meeting of „Volkswagen Klassiker auf der Postalm“ took place. 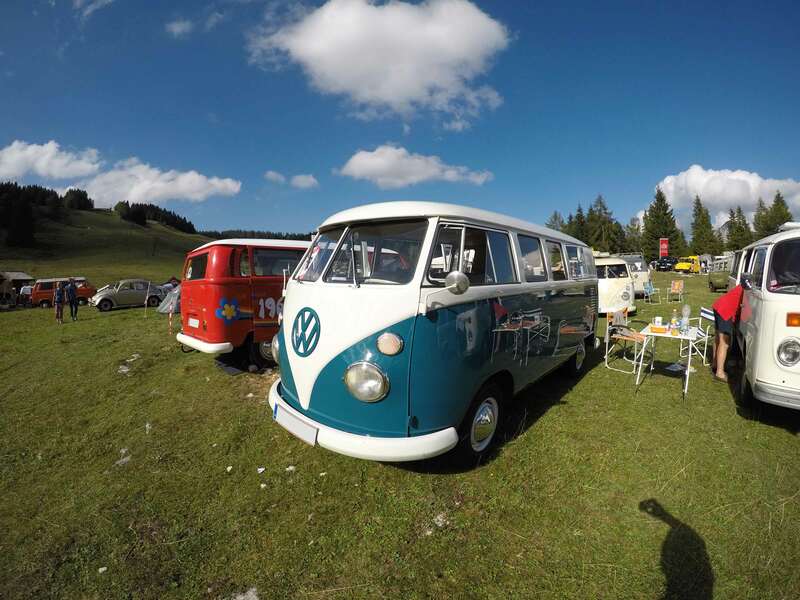 I was already in contact with the organiser some weeks before and so i decided to connect this excursion with another visit at a business that still exists today and used coachbuilt VW buses in the early 50ies – most likely Kohlruss buses. But first let me tell you about VW Postalm meeting! So the event took place the entire weekend, but sadly i just had less than two hours of free time to pay it a visit. But i am already looking forward to the second version of this meeting in September 2019! Maybe in 2020 our splitbus Eve will finally be ready and hopefully we can show up with our own bus then! So even before arriving at the meeting i was impressed by seeing several aircooled Volkswagen cars driving through the mountain roads. Together with some beetles, a Kübelwagen and a Vanagon (T3) I was driving uphill and couldn’t wait to get there. By walking a few more meters around the corner, i finally arrived at „Blonde Hütte“ on Postalm, where the official meeting took place. 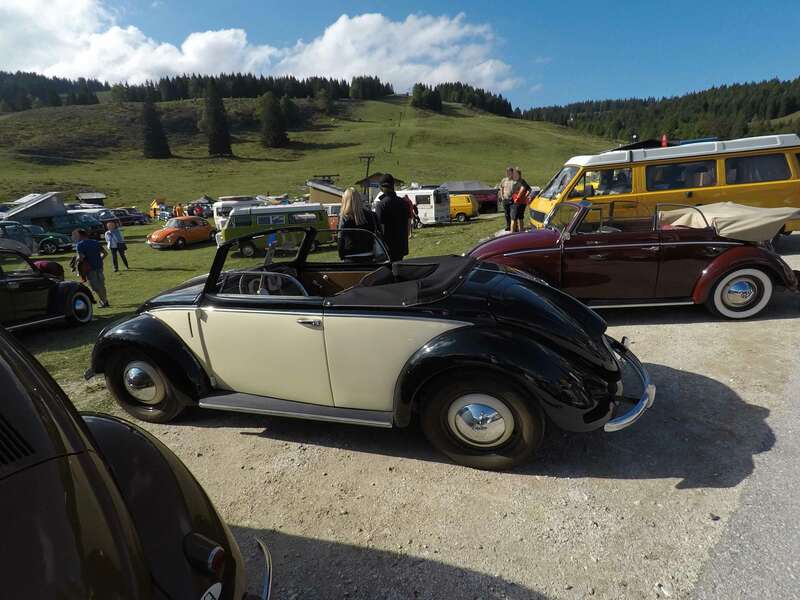 Luckily there was best weather and so i rushed to see all cars – i would say about 100 vintage volkswagen were present. There were VW beetles (even a Hebmüller! 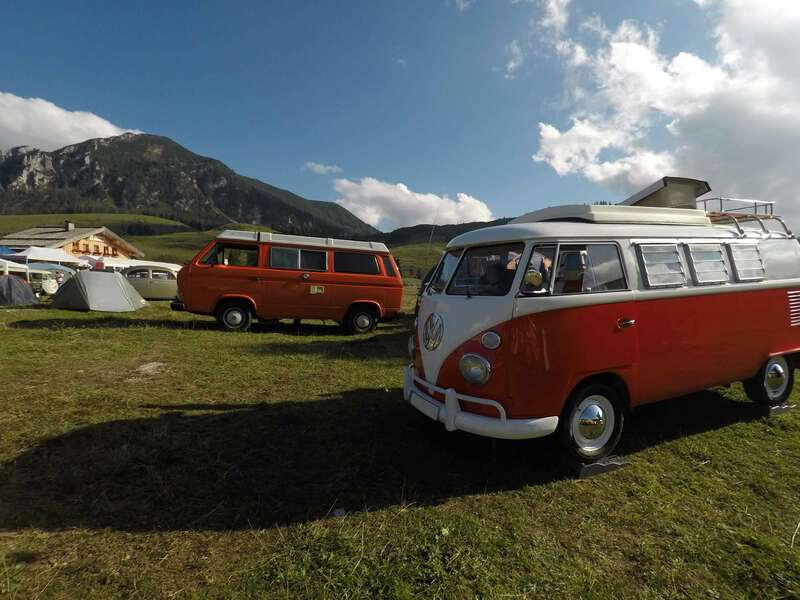 ), VW buses as well as Karmann Ghias and a Fridolin. Although i just had about 1,5 hours of time to spend, i had a great time, taking some quick photos and meeting new people and their cars. I have to say that it was a great meeting that you really have to visit! Although it took place for the first time it was very good organised and attracted lots of participants and visitors. 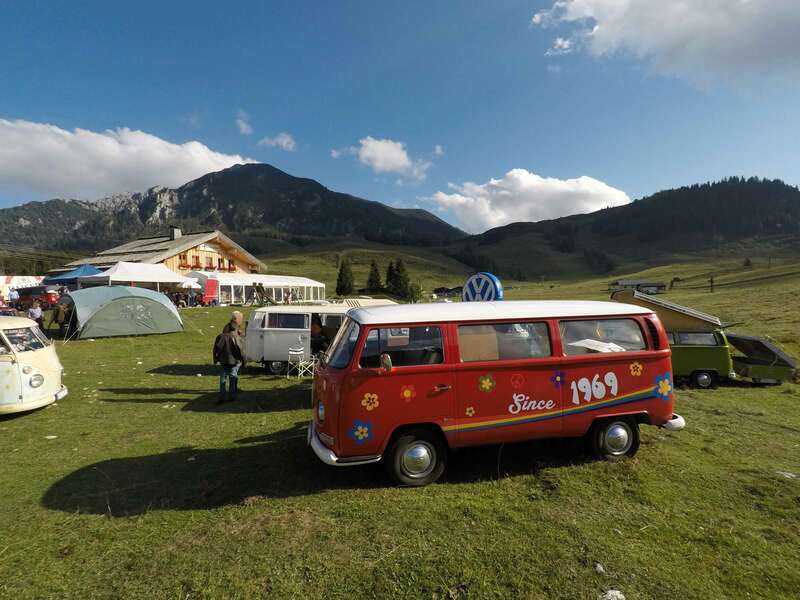 Also the program was sorted quite well – a charity ride, lots of music and even a VW bouncer castle for the kids.. sadly just for the kids.. Of course it was also possible to camp on the area and either use a provided grill or enjoy the food in Blonde Hütte right on the area. All in all i enjoyed it very much and can definetely recommend going there next year! Special thanks also to Johannes for handing me some official merchandise – and of course i could not leave without at least buying a tshirt! If you want so, feel also free to take a look at my other photos that i posted on this album of bugbus.net facebook page. 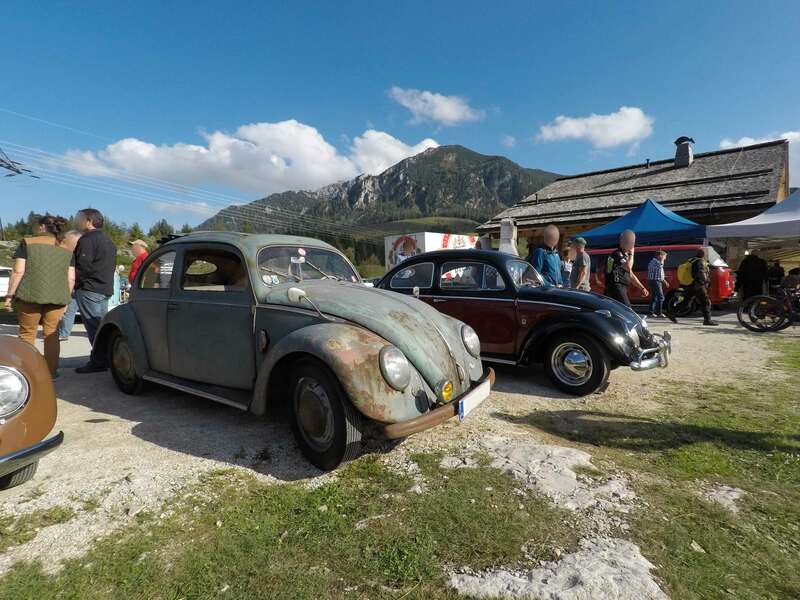 But of course you can find more (and better) pictures at the official facebook site of Volkswagen Klassiker auf der Postalm. Any further information is available on their website. Very soon my alarm clock reminded me to leave and start my way to the next important visit that i planed for that day. Within a short drive i arrived at the house of a family business that exisits since about 1930. Back in the days they had a bus fleet with many big travel buses such as Gräf & Stift and Saurer buses – but also many VW T1 buses. I felt like a little kid as the boss of the business handed me the box with lots of old car papers and vintage photos. 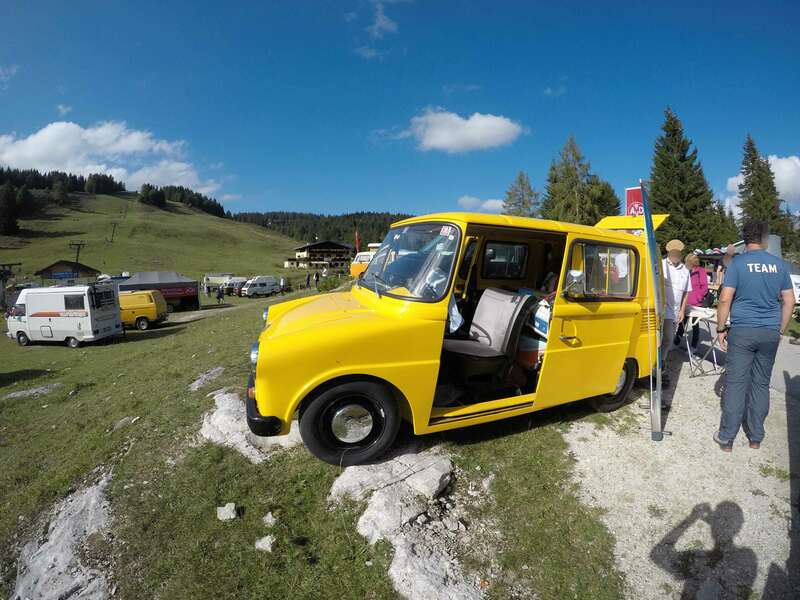 It included several highlights such as a Schwimmwagen at Schafbergspitze in 1942! Awesome! 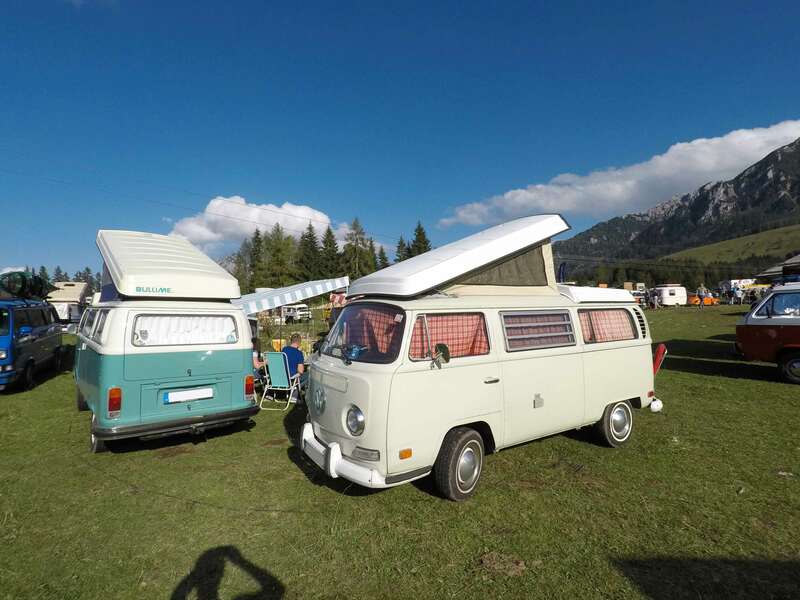 But the biggest smile on my face was caused by a handful vintage photos showing at least two different VW T1 Splitbuses in the early 50ies. Very obviously they have been converted by a coachbuilder as they did not look like regular barndoor buses! Score! My first impression said that they must be Kohlruss buses. These panorama buses had bigger side-windows, that can be compared to later bay-windows (T2). Also they showed some other major differences to a normal Barndoor samba. Such as bigger sky lights on the roof and one bus even had some kind of roof hatch that could be pooped up. And then I discovered something even better: the old papers of a panel (Type 21) from May 1954! Could it be real? I was quite nervous, turning the pages of this old document and looking for any hints guiding me to a coachbuilder. The bus had been built in May 1954, was officially registered in June 1954 and three years later, in January 1957 the authorities were notified about the change from a 3-seater to a 9-seater. After 8 years in service, the bus has been deregistered in October 1962. But sadly there is no stamp or other kind of mention of a coachbuilder – also not a single photo of a bus with this special licence plate still exisits. But apparently 9 people who travelled through the alps did not want to sit in the dark loading area of a panel – at least this is my assumption. And as all other buses of this company during that period were coachbuilt panorama VW barndoor buses, it is obvious, that this exact papers lying in front of me, also belonged to a very special modified bus. I am very happy about all the kind of media that i received during that afternoon, documenting another missing part of Austria lost coachbuild legacy from the 50ies. During the last years i collected lots of information and unfortunately those things will not be posted on the internet so far. What a great day! Driving about 7 hours on that day really paid of – allthough i was very tired as i received at home late at night. I literally fell asleep within seconds.